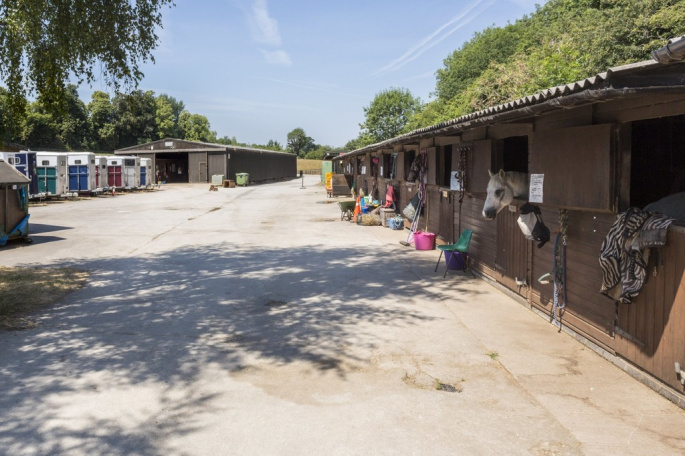 A successful, popular and well known RIDING CENTRE in a highly accessible location close to the A50 near Derby set in approx 15.7 ACRES. 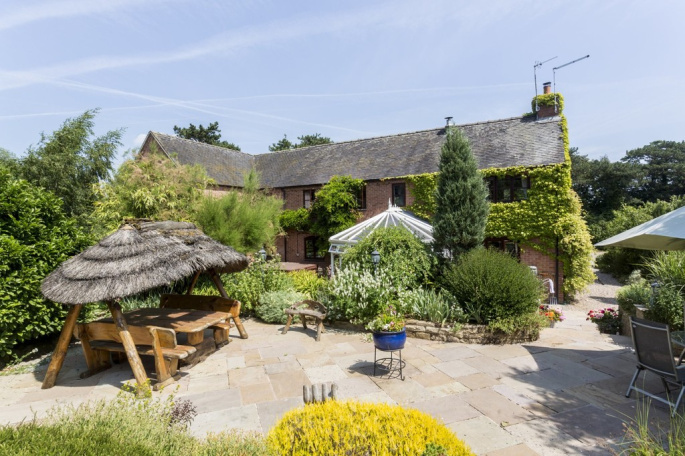 FLEXIBLE LIVING with the benefit of an ANNEXE and STAFF ACCOMMODATION. 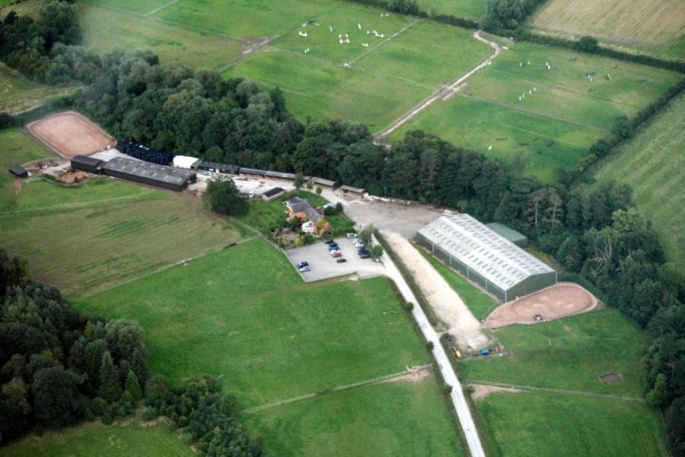 Barleyfields is a successful, popular and well known riding centre in the region with excellent facilities. 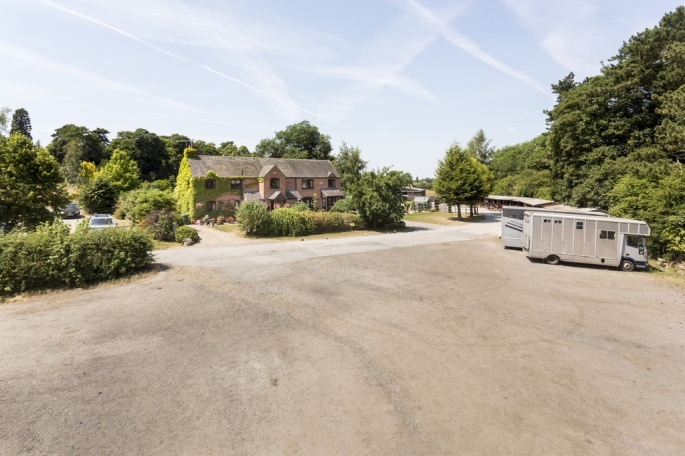 It is ideally located close to populated areas and the road network with Derby about 8 miles and Burton upon Trent about 8 miles. The A50 trunk road (linking the M1 and M6 motorways) is within ¾ mile and the A38, about 3 miles, together bring a wide geographical area within easy reach for customers and visitors alike. The property is approached up a long drive and there are generous hard standing areas for parking and turning vehicles. 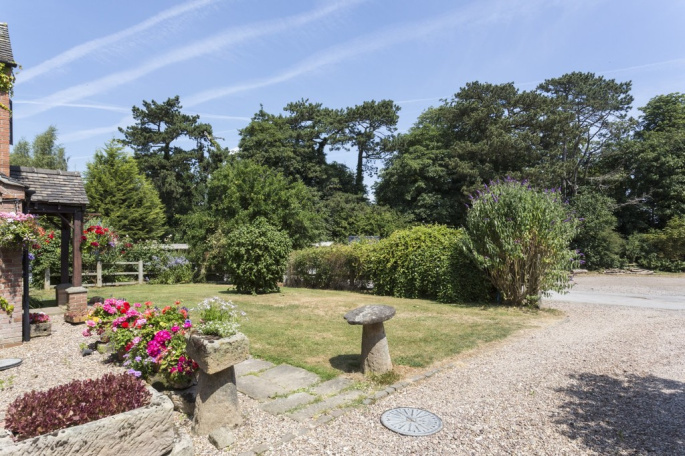 The house, which is well positioned to manage the centre and enjoys a lovely private garden to the rear, provides flexible accommodation and can be occupied as one large 5 bedroom house or, as currently, with a 2 bedroom annexe having an independent entrance, kitchen and bathroom. There is also a separate Chalet style building for staff accommodation. 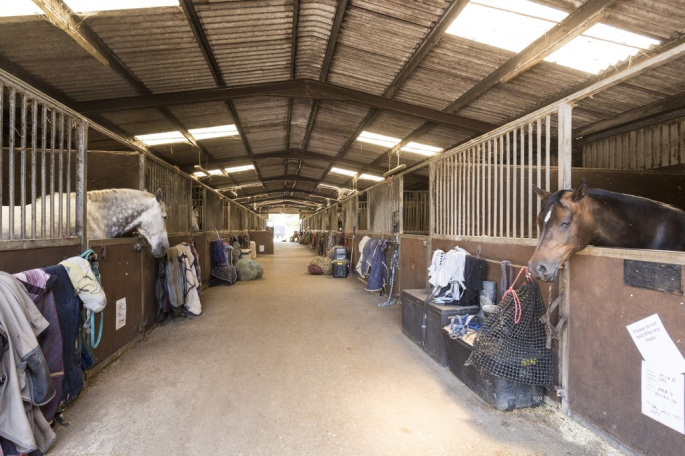 The facilities are extensive with an excellent indoor arena, outdoor manege and stabling for about 44 horses. The house includes an office and within the stable complex there is a shop which is currently run by a third party. 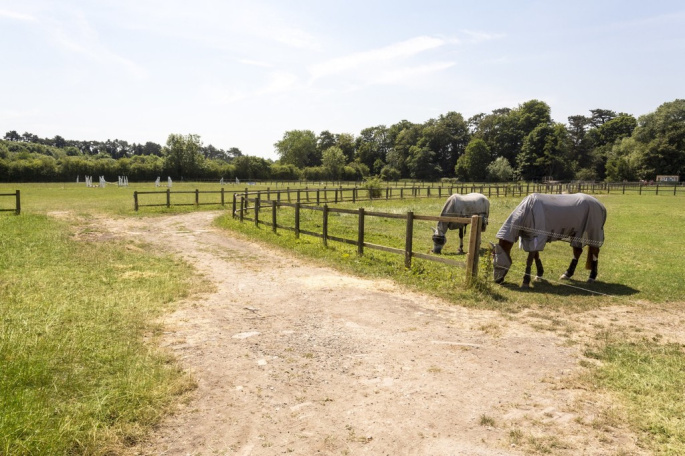 The paddocks are well organised with about 10 acres immediately adjoining the buildings. 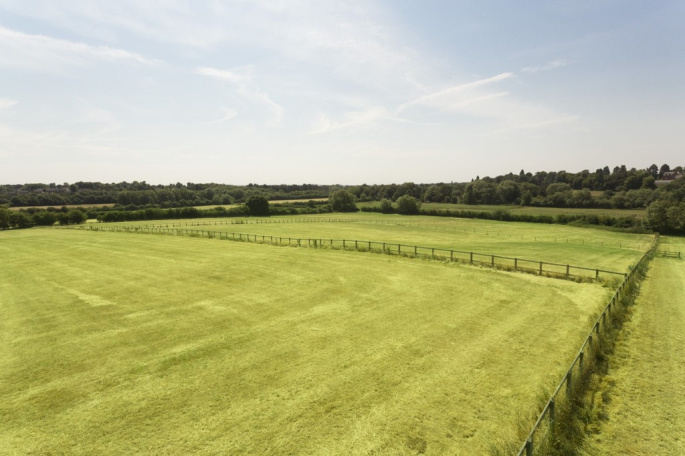 The additional 35 acres is also laid out in convenient paddocks with larger enclosures on the blue land making suitable for hay making. The current Owners have run and built up the centre since 1994 and are now wishing to retire. 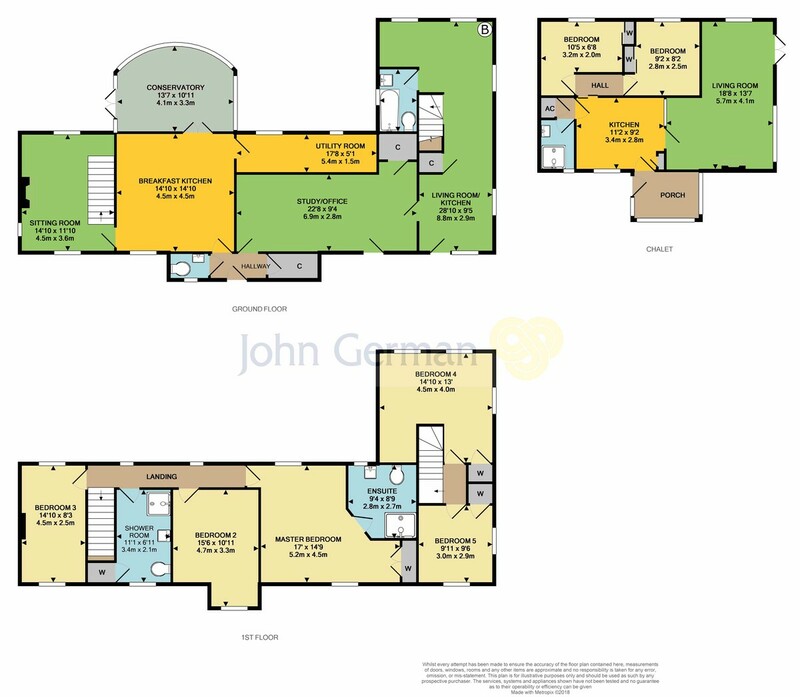 Whilst only the property is offered for sale within these details, the Owners are also willing to consider, subject to negotiation, the sale of the other Business assets, fixtures and fittings. PLEASE NOTE: Where a Buyer requires more than the 15.7 acres there may be an option subject to agreement on terms to rent or buy the additional 35 acres whether in total or possibly the green land only shown on the plan, being about 13.4 acres. Further information is available on request. Entrance Hall with storage cupboard, Guest Cloakroom having a white suite and tiled floor. 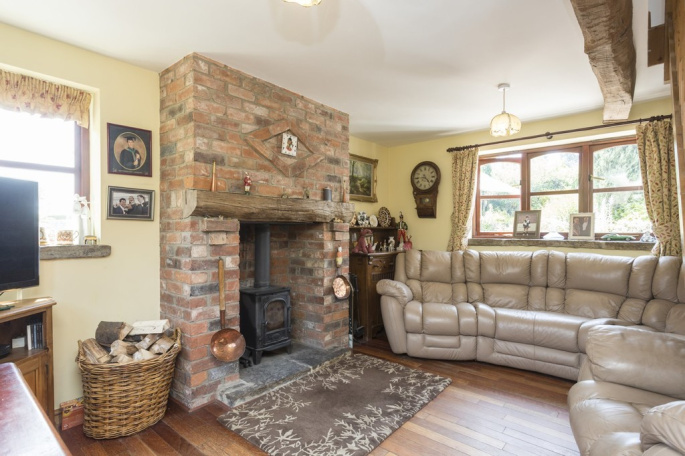 Sitting Room with feature brick fireplace, log burner and stone hearth, wooden floor, dual aspect windows and beamed ceiling. 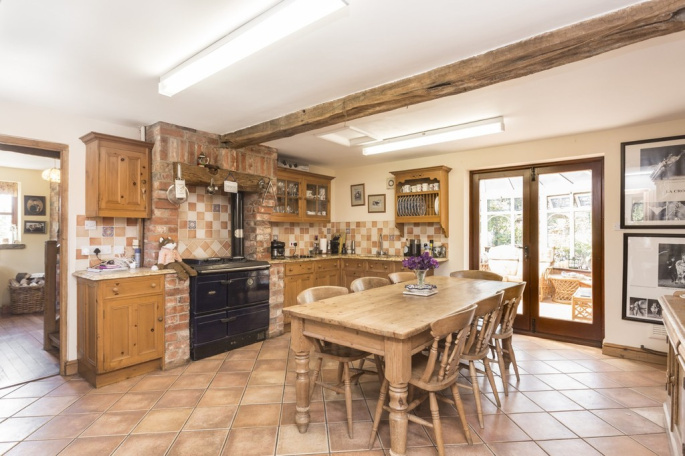 The fitted Farmhouse Kitchen has a range of pine base and wall mounted units with solid granite work surfaces and stainless steel inset sink and drainer, electric halogen hob, integrated Stanley range cooker, tiled floor, beamed ceiling and french doors to the conservatory. 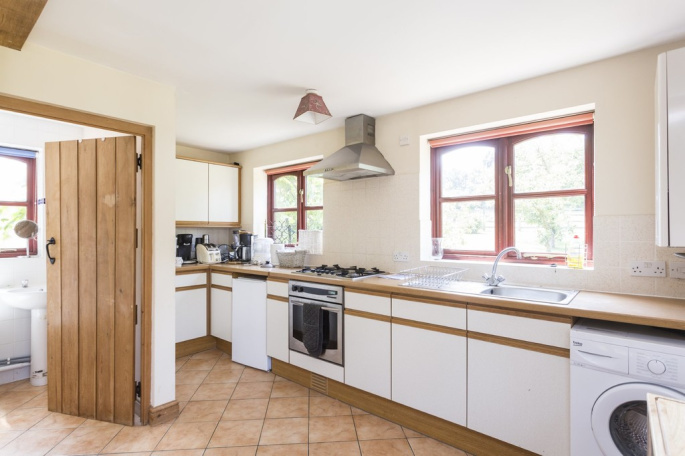 Utility Room with base and wall mounted units, roll top work surfaces, stainless steel sink and drainer, plumbing for washing machine, space for dryer, plumbing for dishwasher, space for fridge freezer and further spaces for appliances. Conservatory with tiled floor and double doors to the rear garden. The Office has a tiled floor and storage cupboard and an outside door provides convenient and independent access for visitors. 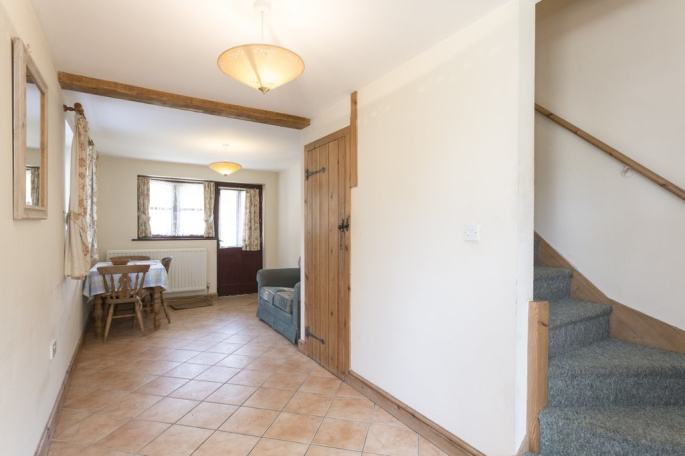 There are internal doors to the Hall and Annexe/ cottage. 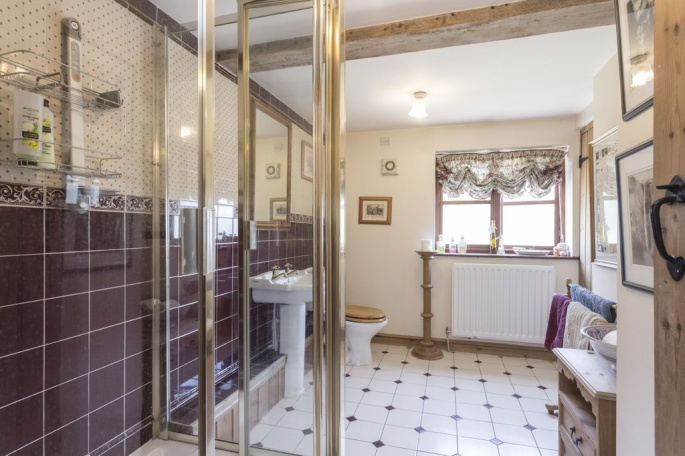 The Master Bedroom is dual aspect with built in wardrobes, En Suite with a white suite including an integrated wash basin with vanity unit, large full body shower cubicle, heated towel rail and tiled floor. 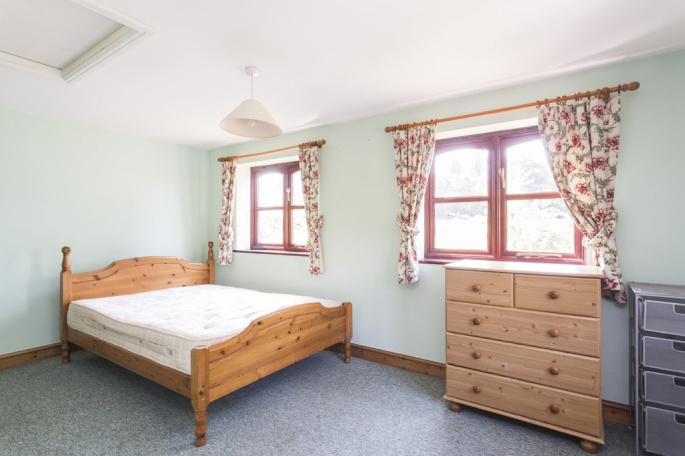 There are Two Further Bedrooms and a fitted Family Bathroom with a white suite including double width shower cubicle with mixer shower, built in airing cupboard and tiled floor. The Annexe or Cottage is part of the main house with inter connecting doors but for convenience has been occupied independently in recent years. The Entrance door leads into an open plan L-Shaped Sitting Room/Kitchen with a range of base and wall mounted units with roll top work surfaces over, stainless steel sink and drainer, gas hob, electric oven, space for fridge, plumbing for washing machine, wall mounted gas central heating boiler, tiled floor, storage cupboard and interconnecting door to the office (in the main house). Ground floor Bathroom fitted with a white suite. 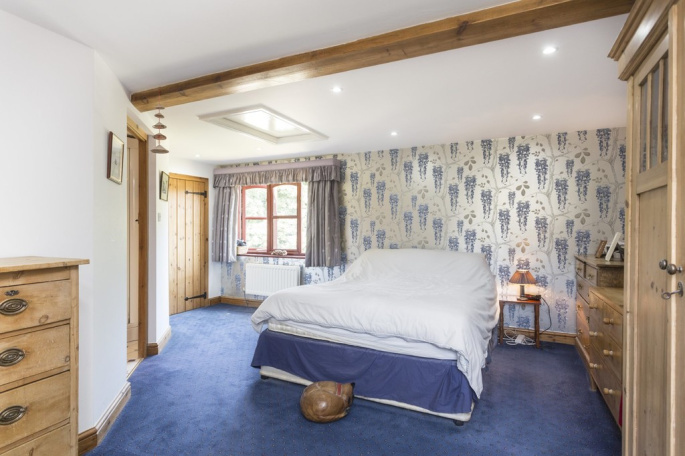 The first floor has Two Well Proportioned Bedrooms, both with wardrobes. To the front of the property is a gravelled driveway to the side and lawned area with display borders, enclosed with hedging. 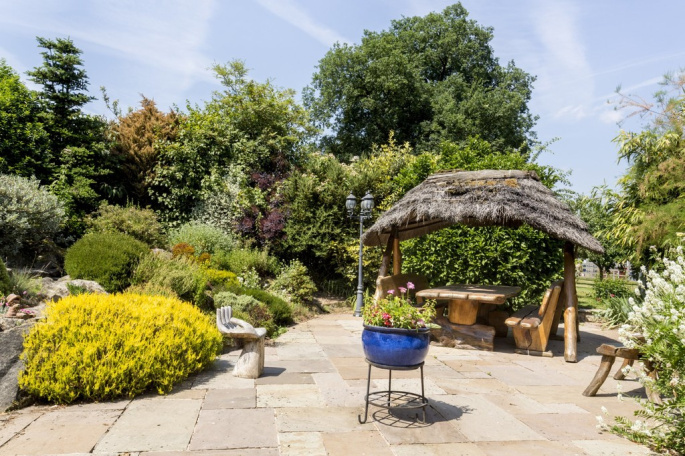 The impressive rear garden is landscaped with a paved patio, steps leading up to a further patio providing a large seating area. 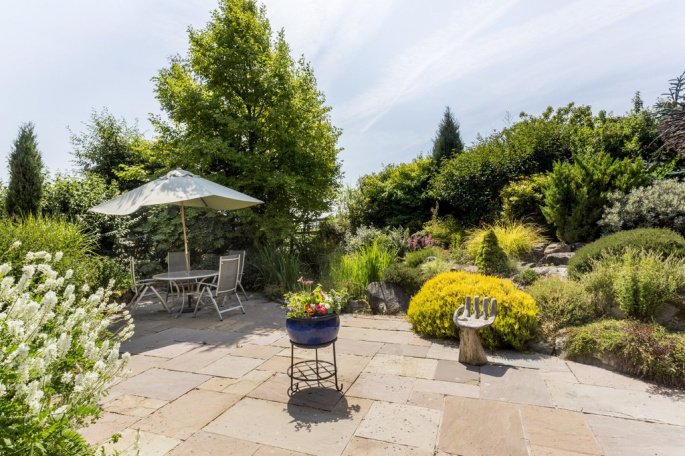 An integrated pond with waterfall, an impressive amount of stone boulders creating a lovely rockery, raised borders packed with a variety of herbaceous perennials and shrubs. There is an ample variety of fruit trees. Detached Wooden Lodge, which is need of refurbishment, provides an Entrance Porch, Kitchen/Diner with a range of base and wall mounted units, Inner hall, Bathroom and Living Room with a wooden fire surround having gas living flame fire, french doors and dual aspect windows. There are Two Bedrooms with built in wardrobes and a Shower Room with a white suite. 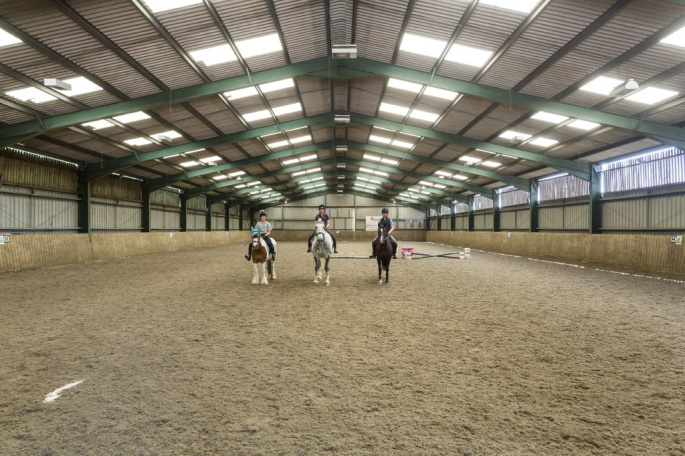 A - Indoor Arena (about 60m x 25m overall) clear span building with 5m high entrance and includes staged spectator viewing Gallery, collecting area, raised Judge/control centre and wc's. The arena has a sand surface with timber kicking boards and cladding and Yorkshire boarding above, is naturally well lit by roof lights and has an extensive array of floodlights. A second doorway leads directly onto the warm up/exercising area - marked C on plan. B - Machinery store (18m x 8.4m) lean to with metal cladding and electric light. D - American Barn (about 45 x 12m overall ) with concrete central passage, 24 stables, 8 of which are "tandem or ½ size" with the majority being about 3.5m x 3.5m. There is also a tack room and separate store/staff area. 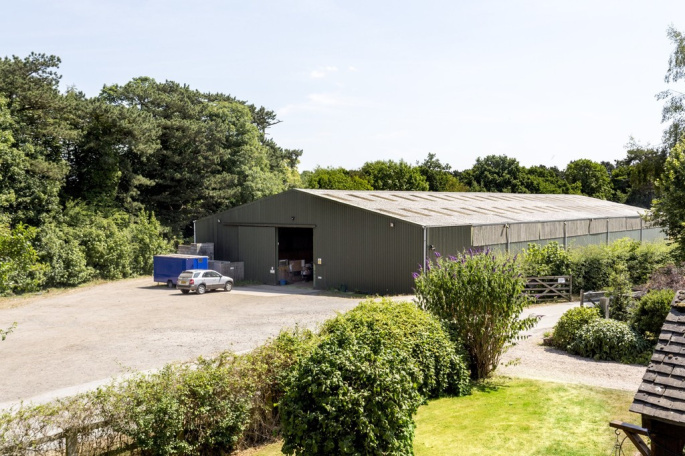 E - Hay / Storage Barn (about 16m x 6.5m overall) with 2 stables and mezzanine storage above, hay/straw storage and Washdown area. G - Manege - (about 54m x 25m) with sand surface, post and rail enclosure and 4 corner floodlights. 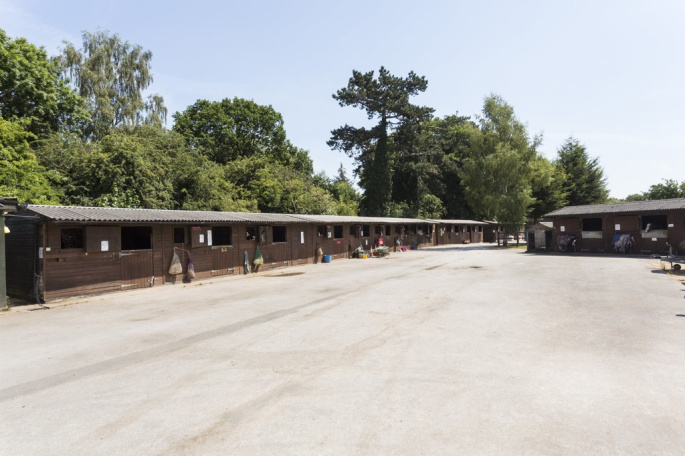 H - Timber stables - There are 18 timber stables in 3 blocks, each with overhang roof and typically being about 3.5m x 3.0m. The larger block also includes 2 stores. There is a main car park for visitors and additional lorry and general parking principally around the Arena. The property extends in total to over 50 acres including the buildings, yards, parking areas and paddocks but as stated earlier, only the 15.7 acres is included at the guide price stated in these details. 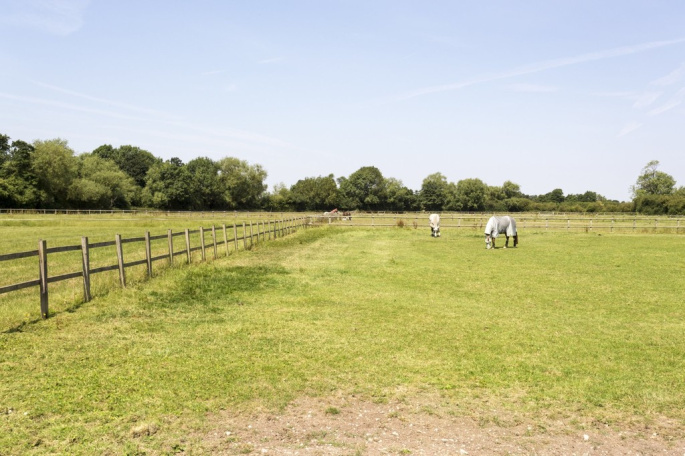 The paddocks are mostly enclosed by post and rail fences or hedging and served by troughs. The main area, edged red on the plan is about 15 ¾ acres and has 7 paddocks/turn out areas providing about 10 acres grazing area. 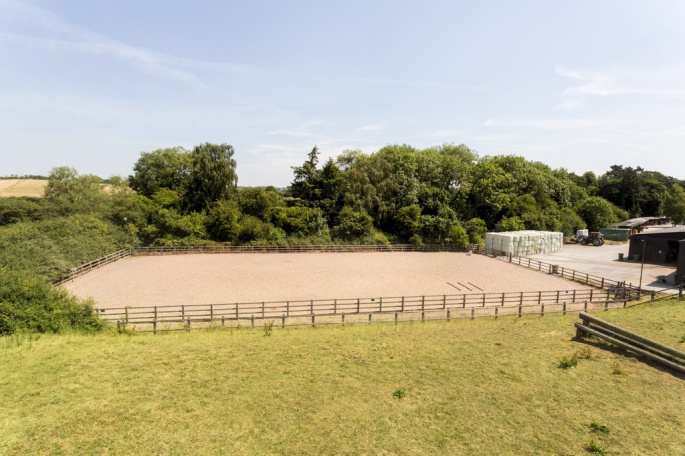 The additional land lies to the east of the Woodland strip and Etwall Brook and is approached via a track from the stable yard. The lower block, edged green, has 8 paddocks and extends to about 13 ½ acres. The top land, edged blue, has 6 further, larger paddocks and extends to about 21 ½ acres. The property is Freehold (Purchasers are advised to make their own enquiries). We are advised there are various covenants and rights affecting the property and further information is available on request. The sporting rights are not included over the additional land edged green and blue edged land. 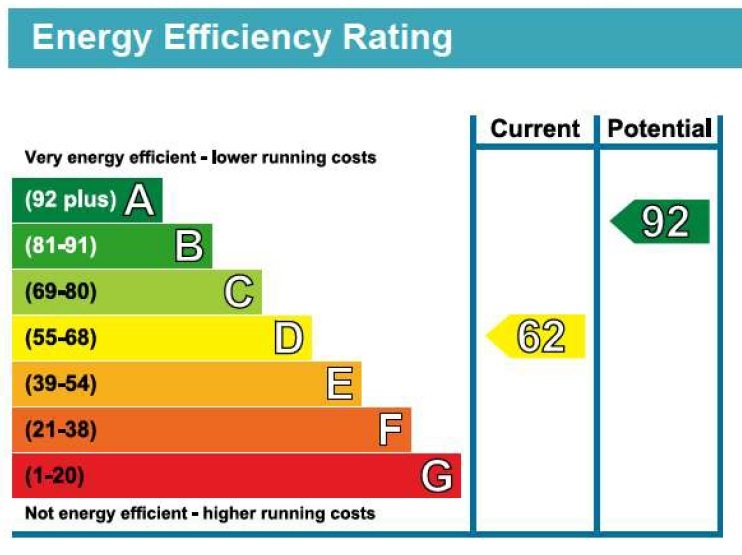 Mains water and electricity, private drainage. Purchasers are advised to satisfy themselves as to their suitability. The property is sold subject to all such matters whether mentioned in these details or not. There is footpath following part of the north east boundary of the blue land which lies between the hedge and post and rail fence. 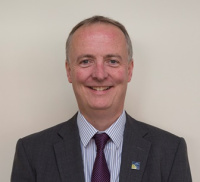 All viewings are strictly by appointment through the Agents - John German 01335 340730. From the A50 at the Hilton junction, take the A516 towards Derby for ¾ mile, passing the right turn to Etwall, and turn left onto Ash Lane. 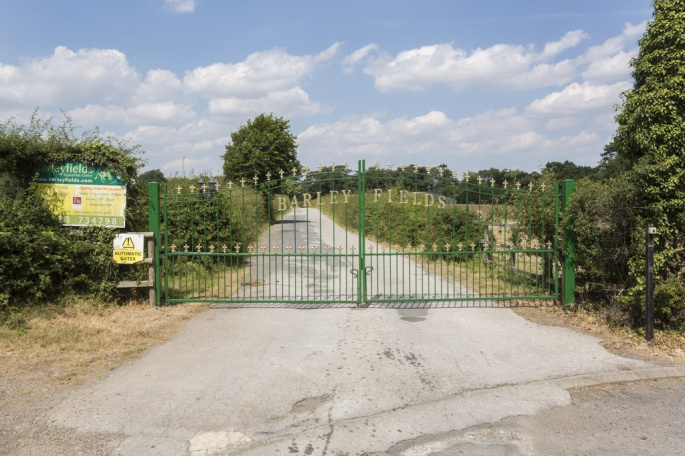 The entrance to Barleyfields will be found immediately after the junction on the right with automatic electric metal gates onto a tarmac drive. 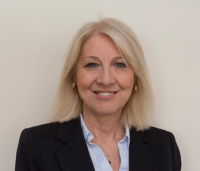 "I recently employed John German to deal with the sale of my property (Barrow Upon Soar) and the service that I received was exemplary. Even from the initial meeting I was impressed wit the professionalism of your employees and was very confident with you acting on my behalf. The numerous back-to-back, group viewings coupled with Barry's brilliant showing of the house ensured that I had a multitude of asking price and above offers to choose from. I was quite taken aback when the sale went to best and final offers and was simply delighted to accept an offer that far exceeded my expectation. I was always well informed during each stage of the process and helpful guidance and advise was given when needed. In particular Lauren Powley was tremendous. She never failed to communicate with me and was always very friendly, professional and helpful. 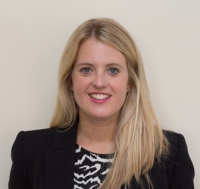 I am left in no doubt that without Lauren and John German the property would have sold at a much lower price and the whole process would have been much lengthier and more stressful."